January 17, 2016 posted by Len B. If only we could see inside each other and ourselves – we just might think twice about what we put into our bodies. 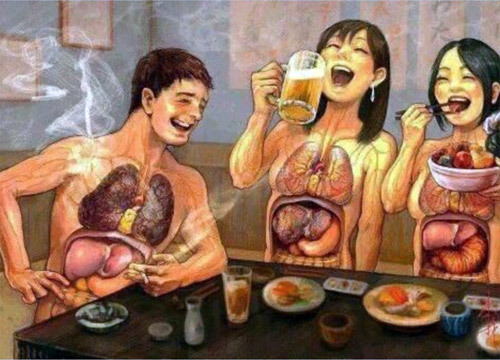 Note the man who’s smoking: unfortunately, the way he’s portrayed as only having discolored lungs tells just a fraction of the real story. What about the potentially fatal damage that’s also being done to his teeth, gums, mouth, throat, esophagus, stomach, heart, etc, etc, etc? The list of body parts that are negatively affected by cigarettes is practically endless! January 23, 2015 posted by Len B. 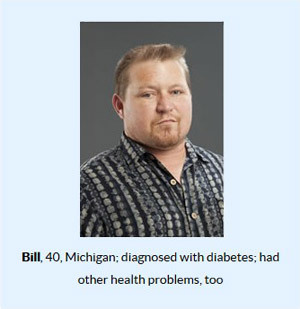 Bill had diabetes. He learned the hard way that smoking makes diabetes harder to control. At 37, Bill went blind in his left eye from a detached retina – damage to the inner lining of the eye. He also had kidney failure. Two years later, at the age of 39, he had his leg amputated due to poor circulation – made worse from smoking. “I lost my leg, and that’s when I quit,” he said. Bill wasn’t killed in war, nor did he suffer any injuries in battle. He died in August 2014 from heart disease. He was 42. November 13, 2012 posted by Len B.
Cannula (pronounced can-U-lah): clear, plastic tubing worn around the head and across the face that feeds supplemental oxygen directly into the nostrils either from oxygen tanks or an oxygen concentrator. Cannulas are typically used by patients with severe lung deficiencies. They are NOT a cure for anything; their sole purpose it to make life somewhat easier for those afflicted with various lung diseases and to keep them alive a little bit longer than they might otherwise be expected to live. Just about everyone is aware of the connection between lung cancer and smoking. Studies have shown that as many as 1 in 4 people who smoke 5 or more cigarettes per day will eventually develop lung cancer. As bad as those statistics are, there’s yet another lung disease caused by smoking that many people are not as aware of. It’s called Chronic Obstructive Pulmonary Disease, or COPD for short. COPD is a progressive lung disease that, as time goes by, makes it harder and harder for people to breathe. You may have heard COPD called other names, like emphysema or chronic bronchitis. In people who have COPD, the airways—tubes that carry air in and out of your lungs—become partly blocked, which makes it more difficult to get air in and out. Smoking is the most common cause of COPD, often occurring in people age 40 and over with a history of smoking. Research indicates that anywhere from 25% to as high as 50% of current and former smokers will develop COPD. Sadly, they also account for up to 9 out of 10 COPD-related deaths. Although there is no known cure for the disease , it is possible to slow its progression by quitting smoking. Some studies even indicate that lung function can improve by as much as 30% within 9 months of having stopped smoking. There are various methods used in an attempt to alleviate some of the symptoms of COPD, including supplemental oxygen and medicinal inhalers. Those whose COPD has progressed to the point that they require supplemental oxygen must wear what is known as a cannula (pronounced can-U-lah) – clear plastic tubing that feeds oxygen directly into the nostrils either from oxygen tanks or an oxygen concentrator. 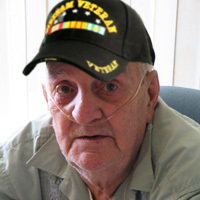 The next time you’re at your local VA Medical Center, make a mental note of your fellow veterans and their loved ones who are wearing cannulas – keeping in mind that smoking probably played a major role in their need for supplemental oxygen using cannulas so that they can live a little more comfortably and survive a little bit longer. You are currently browsing the archives for the Diseases From Smoking category. This is just ordinary text. Call Loma Linda VAMC's stop smoking hotline at: (909) 825-7084 ext 1869 , or your local VAMC's Preventive Medicine clinic.